BMW combines space and power in a phenomenally designed machine and packs it with features, dynamics, performance and individualism to the power of “X”, hence you have the X5M like never before. Behold the essence of genuine exclusivity that is perfectly displayed in quality of character and uniqueness in every detail. BMW fully expresses the true definition of perfection with individualized equipment for the BMW X5M. Contemporary elegance greets infinite dynamism with elements of luxury to be seen and felt. 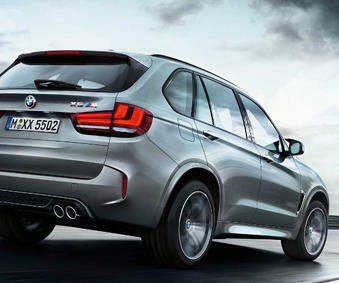 The BMW X5M is not your ordinary SUV and the performance perspective is far from average or what many would expect. To begin, there are two high-rev TwinScroll turbochargers, a cross-bank exhaust manifold for efficient gas flow, optimum power development and lightning-speed responsiveness. The specifications of luxury are clearly expressed with the new BMW X5 M that exceeds the standards in its intimate interior design. Behold the fine-grain Merino leather Criollo Brown, an instrument panel enhanced with Black leather and, for an enthralling contrast, the roofliner Alcantara in Smoke White. There is no feeling that compares to the end result of luxury perfected with this model. Additional color options for the exquisitely high quality fine-grain Merino leather from BMW Individual makes it possible for owners to truly customize the new BMW X5 M.
The design of the wide front apron is an eye-catcher as the large air inlets dominate the scene and captivate the mind. A chrome frame surrounds the M double kidney grille and the headlights flaunt a strikingly bold appearance and shape. Side skirts and all-round crease lines lure into a wedge-shaped silhouette and creates a magical presence. Sporty ambition with a robust nature gives the driver of the X model much more than ever anticipated.